New technology and ships make maritime commerce more efficient, adaptable, and environmentally friendly. Companies operating in the Great Lakes and St. Lawrence River region are making one of the biggest investments in new ships since the birth of the modern St. Lawrence Seaway. The Algoma Equinox slid into the water for the first time at a shipyard in Nantong, China, on December 24, 2012. The 225-meter (740-foot) freighter was destined for the Great Lakes, an early participant in the mid-continent shipping industry’s biggest upgrade in half a century. 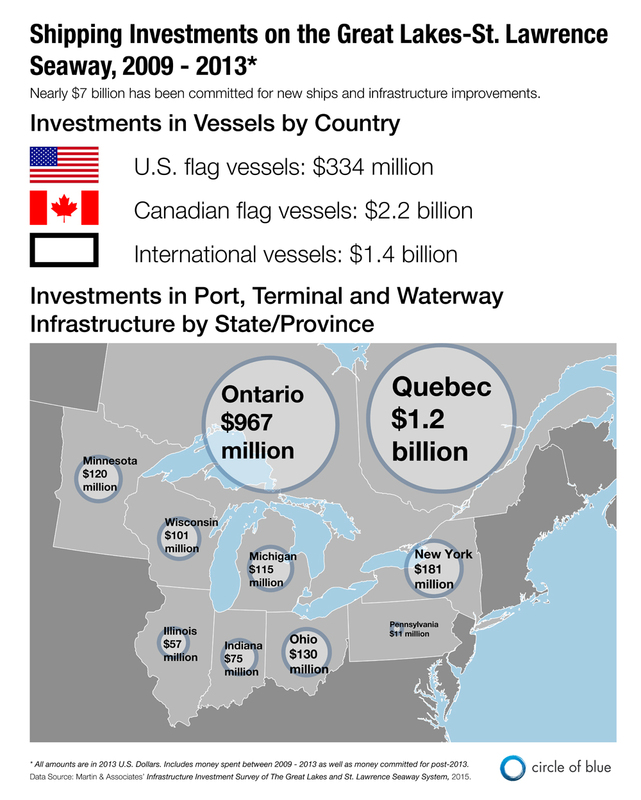 Over the past five years, private companies and governments in the Great Lakes region have committed $US 7 billion to build new ships, improve port infrastructure, and update locks and breakwaters along the Great Lakes-St. Lawrence Seaway, according to an industry survey released this year by the Chamber of Marine Commerce in Ottawa. Made in response to an aging fleet, more stringent environmental regulations, and an increasingly global economy, the investment is shaping the course of Great Lakes shipping for the next 30 to 40 years. At the same time, advancements in technology are providing ship captains and navigators with an increasingly accurate view of shipping channels, allowing them to navigate the Great Lakes and St. Lawrence River system with more precision. In combination, the developments mean more cargo can be moved with less fuel, fewer emissions, and in shallower water. It is the largest infusion of money into Great Lakes shipping since the construction of the modern St. Lawrence Seaway in the 1950s, according to Stephen Brooks, president of the Chamber of Marine Commerce. The Seaway project cost a total of $US 470 million—equivalent to about $US 4.6 billion today. Most of it was financed by Canada. 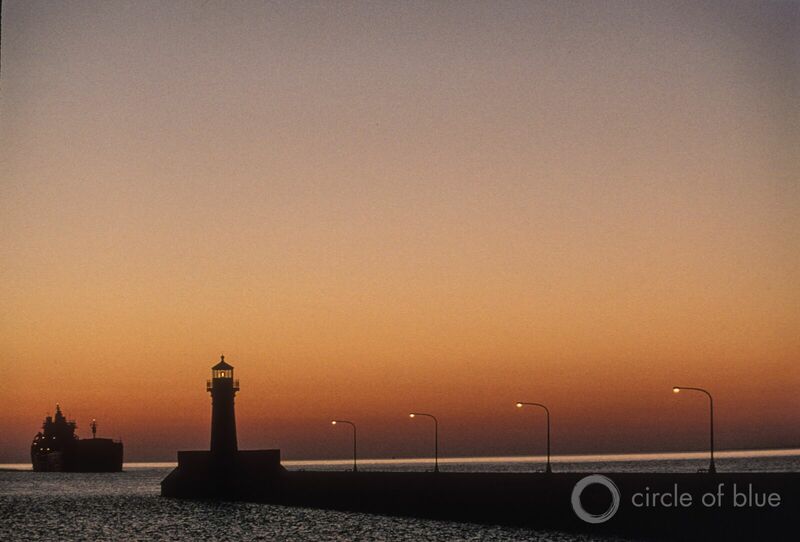 Together with the Welland Canal that circumnavigates Niagara Falls, and the Soo Locks that enable passage between Lake Superior and Lake Huron, the navigation system allows ships to travel 3,700-kilometers (2,300 miles) from Duluth, Minnesota, to the Atlantic Ocean at Sept-Iles, Quebec. Every year, vessels transiting the system carry about 164 million metric tons of cargo including bulk shipments of iron ore, road salt, corn, and wheat, as well as specialized products like wine, furniture, and clothing from all over the world. The vast majority of the money being spent—nearly $US 4 billion—is funding new ships. For years, the industry in Canada was hamstringed by a 25 percent import duty on ships purchased abroad, according to Brooks. When that was lifted in 2010, companies began investing heavily in their fleets. 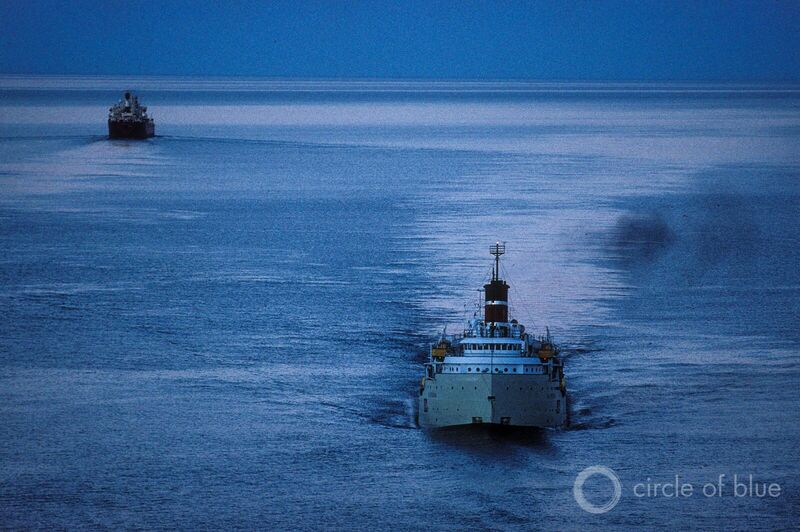 Investments in new ships, technology, and infrastructure are making the Great Lakes shipping industry more efficient and environmentally friendly. The St. Catharines, Ontario-based Algoma Central Corporation, the largest ship owner and operator on the Great Lakes, has announced 9 new ships since 2009. Three are already operating on the lakes, while the others are expected to be in service by 2018. The company’s new Equinox Class ships are generally larger than their old carriers, with most reaching 225.5 meters (740 feet) in length and 23.8 meters (78 feet) in beam, the maximum dimensions for a ship to fit through the St. Lawrence Seaway. They have integrated exhaust scrubber systems that remove 97 percent of sulfur oxide and 75 percent of particulate matter emissions, resulting in an overall 40 percent reduction in air emissions compared to the older ships. In addition, larger propellers turned by slower engines as well as smoother hull coatings improve the ships’ fuel efficiency, said Smith. “The new designs are a lot more efficient in terms of fuel, the emissions are scrubbed, and they’re carrying more,” he said. The Great Lakes-St. Lawrence Seaway navigation system allows ships to travel 3,700-kilometers (2,300 miles) from Duluth, Minnesota, to the Atlantic Ocean at Sept-Iles, Quebec. Even as ships traveling the Great Lakes and St. Lawrence River get bigger, new technology is allowing them to carry more through the shallowest parts of the Seaway. In 2012, Canadian and U.S.-flagged ships began using a tool called the Draft Information System (DIS), which gives captains and pilots a precise view of the surrounding channel and allows them to navigate more safely. The more cargo a ship carries, the lower it sits in the water. The distance a ship’s hull extends below the water’s surface is called its draft, and when a ship travels faster, its draft increases. When it travels slower, its draft decreases. That means that a large ship carrying lots of cargo needs to slow down to cross through shallow areas. But without a good idea of where shallow areas are located in relation to the ship or how the ship’s draft changes at different speeds, navigators must carry less to give themselves a wider margin of error. In the St. Lawrence Seaway, most ships are required to travel with a draft of 8.07 meters (26 feet and 6 inches) or less. DIS, however, provides navigators with detailed, color-coded hydrographic maps of the Seaway that track the ship’s location and speed and show which areas to avoid and which areas are safe. As a result, ships equipped with DIS can travel with a maximum draft of 8.15 meters (26 feet and 9 inches)—a difference that allows the biggest ships on the Seaway to carry an extra 400 metric tons of cargo. 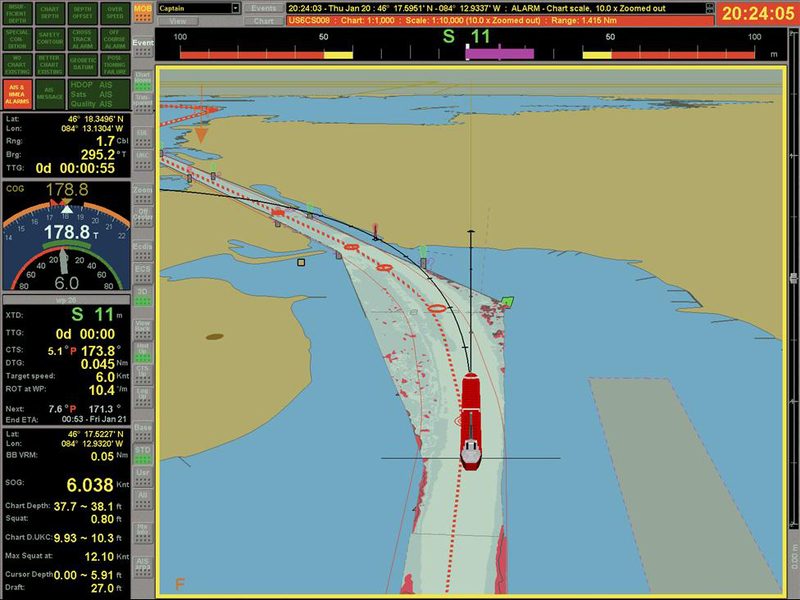 The Draft Information System (DIS) , first used by ships transiting the St. Lawrence Seaway in 2012, provides navigators with detailed, color-coded maps of the Seaway that track the ship’s location and show which areas to avoid and which areas of the channel are safe at any given speed. Even in the rare cases when water levels drop to the point where Seaway managers have to reduce the permissible draft, ships with DIS will be able to travel with 7.6 more centimeters (3 inches) of draft than those without it, Bogora said. Currently 30 ships in the domestic fleet have the technology. Ports along the Seaway are also investing in facility improvements and benefiting from technological advances. The Port of Montreal, for example, is now using a system that allows it to inspect the river and underwater portions of its facilities, such as berth walls, in two days; the process took years in the past. In 2014, it spent $US 20.5 million upgrading and expanding its container handling areas and ship berths and announced a $US 59 million project to restore a historic pier and passenger terminal for cruise ships. 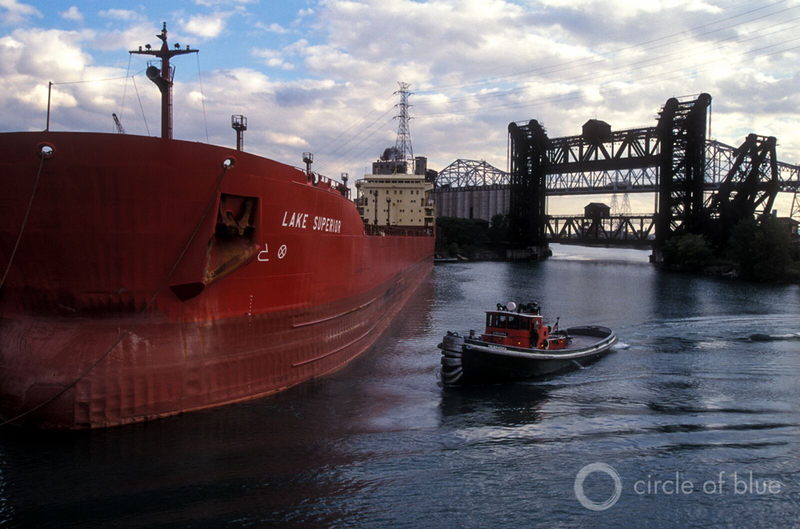 Every year, vessels transiting the Great Lakes-St. Lawrence system carry about 164 million metric tons of cargo including bulk shipments of iron ore, road salt, corn, and wheat, as well as specialized products like wine, furniture, and clothing from all over the world. The port’s business is growing. A record 30.4 million metric tons of cargo passed through its facilities in 2014, as well as more than 71,000 cruise passengers. One of its biggest challenges, according to Dagenais, is visibility in an increasingly global market shaped by shifting economic centers. In 2000, nearly 80 percent of the port’s overseas trade was with northern Europe. By 2013, Europe’s share dropped to 44 percent.